The DeLuxe Stitcher MiniStitcher is a table-top version of the StitchMaster that is designed for flat stapling applications. 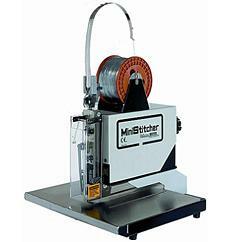 The MiniStitcher is completely portable and is ideal for closing padded envelopes, carding and blister packs, with a capacity from 2 sheets to 1/4”. The MiniStitcher comes standard with parts for 25 gauge or smaller round wire. However, any MiniStitcher can be modified to accommodate any of the following wire sizes: 23 or 24 gauge round or 21 x 25 flat. The MiniStitcher has a capacity up to 1/4″ or 60 sheets of 20 pound bond paper with 25 gauge round wire and up to 1/8″ or thirty sheets of 20 pound bond paper with 21×25 flat wire. The MiniStitcher accommodates flat stitching only with a solid clincher but easily adjusts to control both work thickness and centering the stitch. The MiniStitcher’s foot switch provides for easy operation in either single or continuous stitch modes at the touch of a button. This convenient MiniStitcher can be placed on any sturdy work surface and plugs into any standard wall outlet. If you have any questions or are interested in purchasing the DeLuxe Stitcher MiniStitcher, visit us at SpiralBinding.com. We have great pricing on a full line of Heavy Duty Staplers. Call us at 1-800-631-3572 for more information!